This cake is easy to make and really delicious. Serve it warm as a dessert with ice cream or lightly whipped cream, or cold for afternoon tea. Preheat the oven to 180°C, gas mark 4. Grease and line the base of a 23cm round, deep cake tin. Peel, core and thinly slice the apples, toss in 1 tsp of the cinnamon and set aside. To make the crumble topping, measure 50g each of the caster sugar, butter and flour into a bowl. Add the remaining cinnamon and rub everything together with your fingertips until it forms a rough crumble. Set aside. Put the remaining sugar and the eggs in a large bowl and use an electric whisk to mix together. Whisk for about 10 minutes until the mixture is pale and thick, and leaves a trail on the surface when the whisk blades are lifted. Melt the remaining butter in a pan, cool slightly, then drizzle into the whisked mixture, folding it in carefully to preserve as much air as possible. Sieve the flour over the top and fold in. Turn the mixture into the cake tin and scatter the apple slices evenly over the top. 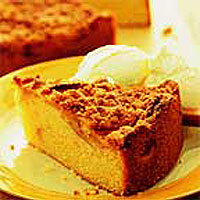 Sprinkle the crumble over and bake for 50-55 minutes, until the cake is firm to the touch and golden brown. Allow to cool for 10 minutes in the tin, before turning out. Serve warm with Waitrose Clotted Cream Ice Cream or lightly whipped cream. Alternatively leave to cool. The key to success with this cake is to whisk the eggs and sugar for long enough for them to hold the butter and flour crumble in suspension. Don't be tempted to rush this stage. Check that there is a trail on the surface of the egg mixture when you lift the whisk, before adding the other ingredients.